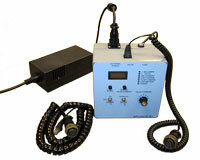 ValveTest is a portable hand-held self-powered hydraulic valve test unit. Capable of testing both servo and 24 VDC proportional hydraulic valves, the units size is 6.9" x 6.3" x 4.5" and weighs 6.25 lb. An integral battery allows the tester to power both types of valves for extended periods of time. Valve test coil cords are supplied with the valve mating connector of your choice. The unit self-configures itself to output a current or a voltage command upon connection of the appropriate valve test coil cord to the unit. When testing proportional valves, an internal 24 VDC power source provides operating power to the valves on-board electronics and a ±10V signal drives the valve spool. Servo valves are controlled in a similar fashion with a ±100mA signal driving the two valve coils, which can be operated in a series or a parallel electrical connection. The external power supply included with the unit operates from 120VAC and can operate the unit continuously or charge the internal battery.